Short Term Health Insurance plans provide coverage for a set period of time. In years past these plans were mostly purchased when people were between jobs, graduated from college, or an adult child aging off a parent’s policy. However, with the introduction of the Affordable Care Act, Short Term policies are the fastest growing segment of the health insurance industry. Need insurance for the rest of 2019? Get a Quote on Short Term Medical Insurance. Why Are Short-Term Policies Popular? 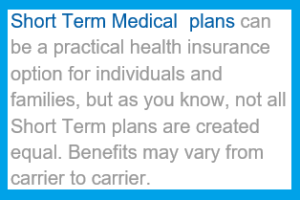 Short Term policies are popular because they are priced far less than the Obamacare or ACA compliant plans. For example, a 48 year old male can buy an ACA Compliant plan for $435 a month for a $2500 deductible. Or, the 40 year old male could buy a Short Term policy for $150 per a month for a $2500 deductible. The Short Term policy would also give access to a national PPO network. What is the Coverage on a Short Term Policy? A Short Term policy focuses on unforeseen accidents and illnesses. The policy does not provide coverage for preexisting conditions. For example, a 55 year old with diabetes would not want to buy a Short Term policy, because diabetes testing, medications, and supplies would not be covered under the policy benefits, due to it being preexisting. Furthermore, many Short Term policies would not offer the coverage to a person with diabetes. The same would be true of other preexisting conditions like heart attack, stroke, and cancer to name a few. How do I get a Quote on Short Term Health Insurance? Simply visit our quote request page and we can show you quotes from several Short Term health insurance companies. Some carriers are better than others depending on an applicant’s current health status. Some carriers are very selective in offering coverage. Short Term health insurance does have limited underwriting, so depending on your current health, it is possible to have your application declined. Are Short-Term Medical Policies Obamacare Compliant Plans? Obamacare plans contain ten MECs (Minimum Essential Coverage), including benefits like maternity. Short term coverage does not include the maternity, nor does short term coverage include preventive benefits like OBGYN visits or Physicals. Short term coverage is a policy designed to keep money in your pocket and to provide coverage when you need it most. For this reason Short Term coverage is not ACA compliant. However, with the cost of Short Term insurance being up to 65% less than ACA coverage, a Short Term policy will keep a great deal of money in the your pocket. Today the average Short Term policy saves a member around $230 a month or over $2700 a year. It is not uncommon for a family of four to save $10,000 a year by purchasing Short Term medical insurance. What about my Short Term PPO Network? More and more Americans are buying Short Term insurance to gain access to doctors and hospitals. Companies like Aetna, Anthem, First Health, Blue Cross Blue Shield, and Multiplan are offering their PPO networks to Short-Term members. Many of the Obamacare / ACA plans are HMO or POS policies and they require referrals for service, Short Term insurance does not require specialist referrals. How Long can Short Term Medical Insurance Last? Short term plans are sold from 30 days to 360 day intervals. Many Americans purchase a short term option to bridge them to December 31st and through Open Enrollment. This give the insured an opportunity to then purchase an ACA or Obamacare plan if they feel that coverage would be better. An example of this would be a person needing a surgery or anticipating an expensive medical claim. It may be best to enroll in an ACA or Obamacare plan with a very low deductible. ACA and Obamacare plans cannot deny you coverage. Why should I buy Short Term Insurance vs Obamacare? 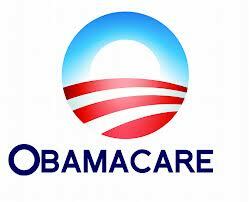 The law very clearly states that a short term health plan is not ACA / Obamacare compliant. However, this does not mean short term health coverage has less value. With the large PPO networks offered with short term insurance, combined with a price point that is nearly 60% less than ACA plans, it is no wonder millions of Americans are seeking out short term coverage. Many individuals receive quotes from the health insurance marketplace for $300-$500 per a person. Many of these plans have $6600 deductibles. It is no wonder the Affordable Care Act has a tendency to leave shoppers scratching their heads trying to budget $5K, $10K, or even $15,0000 for a health insurance policy with catastrophic deductibles. For example, a 45 year old can get a $6,600 deductible ACA plan for around $4,000 premium per a year. OR this same person could buy a short term policy with a $2,500 deductible for less than $2,000 a year. In the event the person must pay an Obamacare penalty of $695. The total cost would only be around $2700. So not only would the purchaser have access to an excellent short term PPO network, but they would also have a much lower deductible and that person would save over $1300 a year. Short Term medical insurance may be temporary, but in most states applicants can reapply for back-to-back coverage terms. This is a good way to keep covered until the next ACA open enrollment. Also, critical illness, cancer, and accident insurance are also a great addition to Short Term coverage. These products can help close the gap on deductibles and out-of-pocket costs in the event of a major illness or accidental injury. These types of policies are stand alone policies and continues even if a member ends their short term health insurance. Critical illness, cancer, and accident insurance provide money to you when you need it most and are an affordable way to enhance your short term medical. Short Term Health Insurance does have a simplified underwriting. The questions are different from company to company, but here is a sample of some of the questions. You can be declined coverage if you would answer yes to one of these questions. Short term health insurance is best for people who have no pre-existing. In 2019 short term health insurance is 1/3 the cost of Obamacare or ACA coverage. Most health insurance agents buy short term medical because it is a great value and great access to doctors. A family of 4 in Alexandria was on Carefirst through the Marketplace and their rate for 2018 was heading up to $2,366 per a month for a CareFirst HMO Silver $3500. The family could not really afford the plan and the family is for the most part healthy and has no ongoing conditions. Option 1: The family pay $2,366 a month for Carefirst. The family knew they could not do Option 1 it simply was not affordable. Option 2: The family enrolled in a 12 month short term policy for $742 per a month. The largest negative for this family is they may have to pay a tax penalty. Their accountant said the most that tax penalty would be is around $2700 per a year. However $2700 is far less than buying the Obamacare plan. Furthermore, if the Tax Bill becomes law the health insurance mandate will be repealed and the family would pay no penalty at all. Some other negatives are that drugs and preventive coverage would be subject to the plan deductible. The Carefirst plan would have better preventive and drug coverage. The Virginia family spoke with their doctors and their preventive would probably run them around $1,000 for the year, once again, not much money compared to a $2366 per a month health insurance policy. If you would like to get a quote and discuss short term health insurance with us, please submit for a quote.